Fifty years ago, Thomas F. O’Dea, a Catholic sociologist who taught at the University of Utah from 1959 to 1964, published a landmark study titled simply The Mormons. It remains one of the most widely cited social science treatments of Mormon society and culture. Now, after five decades of additional scholarly inquiry, this volume revisits O’Dea’s life and work, while offering new insights about the LDS Church and its members. Scholars from the U.S. and Europe contribute to an examination of the interplay between contemporary social issues and the church, including such topics as civil rights, the women’s movement, homosexuality, rising divorce rates, and childbirth outside marriage. The relationship of the church to the nation is considered. Finally, issues relating to the international church are also discussed. 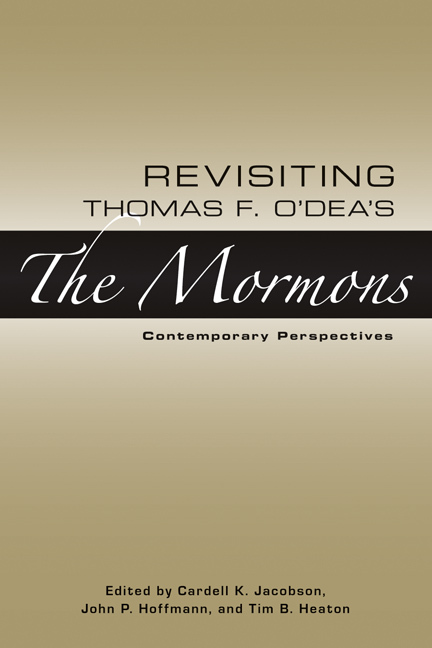 Drawing from diverse fields such as sociology, economics, theology, psychology, and anthropology, each contribution offers a reflection of O’Dea’s The Mormons while considering the persistent themes and contemporary issues that face the church today. Cardell K. Jacobson is professor in the department of sociology at Brigham Young University. John P. Hoffmann is professor in the department of sociology at Brigham Young University. Tim B. Heaton is professor in the department of sociology at Brigham Young University. "Written by a stable of scientists, most not part of the LDS Church, Revisiting Thomas F. O'Dea's 'The Mormons,' already has spurred a daylong university symposium and is likely to provide fodder for those who study the church—and more directly, its members—for some time to come."